I am a mess of tears on the train. Can't remember the last time a book broke my heart so much... (Lucy Dillon on Away from You) Perfect for fans of Adele Parks and Maggie O'Farrell. Since their youngest son, Teddy, was diagnosed with a life-defining illness, Anna has been fighting: against the friends who don't know how to help; against the team assigned to Teddy's care who constantly watch over Anna's parenting; and against the impulse to put Teddy above all else - including his older brother, the watchful, sensitive Isaac. And now Anna can't seem to stop fighting against her husband, the one person who should be able to understand, but who somehow manages to carry on when Anna feels like she is suffocating under the weight of all the things that Teddy will never be able to do. As Anna helplessly pushes Tom away, he can't help but feel the absence of the simple familiarity that should come so easily, and must face the question: is it worse to stay in an unhappy marriage, or leave? This story centres around Anna's family, her husband Tom and her two sons Isaac and Teddy. Teddy has SMA type 2 and the book gives some education on it without being too heavy in medical jargon or clinical. The bulk of the story is the effect Teddy's condition has on them all, how they interact, cope and go about their days. How the attitude and choices of one impacts on the others and the actions that follow as a result. I don't know if the author has any experience either with a condition like this or a loved one who has some similar condition. Despite it being a fictional story it has a very real voice on the difficulties of every day life, things we take for granted that someone with a chronic condition could have great difficulty with. Add into that the emotions, strain and focus each family member has, the mother who has to be superwoman, ensuring the rights and safety of her child. The husband who is the bread winner but feels like a spare part at times when it comes to the inner workings of his family and his relationship with his wife. And the brother Isaac, older but still a child himself living with everything revolving around and putting Teddy first at all times. It is heavily focused on the relationships between the four main characters, marital difficulties, relationships and friendships with those outwith the inner family. Social interactions, those with medical professionals and the outer branch of professionals involved in Teddy's care. The story is multi narrative, all chapters are headed with the person whose view point we will be seeing it from so it is really easy to follow. There is a lot of emotion within the book, it tackles many issues and made for interesting reading, I do enjoy a book where medical conditions pop up. It took me a wee bit to settle into the different view points, easy enough to follow who it is but they have different voices and issues so a wee bit jumpy in some aspects. I did however enjoy the book, Langdale has a nice tone when writing and you can slip into the plot with ease. 3.5 stars for me this time, I have read her before and would read her again, as always my thanks to the publisher. A gripping thriller from the Sunday Times bestselling author of Run, Mandasue Heller. When Ellie Fisher misses her train home one night, she has no idea that being in the right place at the wrong time will change her life forever. That night she comes across Gareth, a young man about to take his own life, because as far as he’s concerned there is nothing left to live for. Putting her own life in danger Ellie convinces Gareth that there is always something left. Her own life is no bed of roses, she explains, but she always pushes on. However, good deeds aren’t always repaid the way we want. Has Ellie unwittingly put her life in danger, or is the real danger a lot closer to home? Ellie Fisher misses her train home, bringing her into the path of a stranger Gareth who is going to take his own life. Ellie puts herself at risk, saving Gareth and in turn causing more ripples in her own life. Her controlling husband is suspicious, her colleagues take advantage of her good nature as does her sister who is utterly vile. All actions have consequences and Ellie is about to discover just how big an impact one kind deed can have on her life and those around her. It has been a while since I read a book that grabbed me pretty much from the get go and it wasn't due to the knowing something bad was coming. The relationship dynamics infuriated me, I wanted Ellie to deal with the selfish horrible people in her life and put them in her place. I think depending on your family life and personal experiences will depend on how much that part of the story will impact on you. I was so infuriated I could have flung the book because I was so angry at how much Ellie allowed people to walk over her. The more I read and the more things happened I got so exasperated, then you have the violent side. Things start happening, you don't know who to trust or really what is coming next. I have always enjoyed Heller's books, I didn't even look at the blurb when going for this book so it was a bit different from what I expected. It isn't her normal estate gritty type book, this is relationships, families, stalker type vibe with violence, suspense and building up page by page. 4/5 for me this time, available to buy from 28th December this year, my thanks to Netgalley. Sometimes a lie seems kinder than the truth . . . but what happens when that lie destroys everything you love? Unsettling things keep happening in the large rented house, Joe is distressed, the next-door neighbours are in crisis, and Tess is sure that someone is watching her. Greg's work is all-consuming and, as the baby's birth looms, he grows more and more unreachable. Something is very wrong, Tess knows it, and then she makes a jaw-dropping discovery . . .
Tess has upped sticks and moved with her son to Boston to be with her husband Greg and his job of a lifetime, paediatric heart surgeon. Feeling isolated things between Tess and Greg become tense, weird things keep happening in the house, someone is sending threats to Greg and Tess can't work out her neighbours intentions. Is it paranoia or is someone terrorising Tess and what is Greg hiding from her? Whilst there are aspects of this book I did enjoy and like then there were things that really grated me. I did enjoy the tension, the way Atkins build up an atmosphere that had me turning page after page to find out what was going on. Slowly leading you on, crumb by crumb and giving you questionable actions and characters you weren't sure where you stood. At times Tess really irritated me, I wanted to scream at her for some of her very suspect actions, lack of or just her chain of thought. I suspected everyone and trusted nothing which is always a great thing for an author to achieve with a reader. I really disliked many of the characters which isn't a bad thing as many hated characters have made books the success they are. I don't like when characters do a complete change in their character and I felt that happened a wee bit in this. There are a fair few twists and it was an interesting read but I just felt the things that annoyed me really annoyed me. 3/5 for me this time, this was my first dance with this author, I would read her again. Christmas 1941 and the nurses at the Nightingale are facing their toughest winter yet. With shortages everywhere, and every news bulletin announcing more defeats and losses, the British people are weary and demoralised and The Nightingale Hospital is suffering too. Jess is struggling with her move from East London to the quiet of the countryside. Effie finds herself exiled to a quiet village, but the quiet doesn’t last for long as she soon finds excitement in the shape of a smooth-talking GI. As Christmas approaches, even the shelter of the countryside can’t protect the girls from heartache. I do love a book about nursing, set during the war or when it first started out. Nightingales is set in 1941 and we follow three main characters, Millie, Jess and Effie. Millie is a war widow with a little boy, lady of the manor and an overbearing grandmother who is set in her thoughts of how Mille should behave. Jess is in the country to help out, sent from London and finding her feet whilst dealing with her superiors dislike for Londoners and their "know everything" attitude. Effie has come from Ireland, she is on the run from something and just wants a bit of fun inbetween her nuring. There are other characters too and between them all we see the issues faced in the 40's during war, being a nurse, being an aid, soldier, a woman in that time period and all the trials and tribulations that follow. I am partial to this kind of read, I just love it. You learn a wee something, you have some kind of scandal, questioning morals, friendship, bonding, a bad guy or two to dislike or hate and some acts of kindness to warm the cockles. I could read this time of book in one sitting if time and life permitted to be honest. The writing flows, the characters you invest in relatively quickly regardless of if you like or hate them, you engage. Despite this being book seven I think it is my first read with these characters and I didn't feel at a loss coming in so late. I will absolutely be buying up more by this author. 4/5 for me this time, you will laugh, rage, be moved and annoyed at parts and who doesn't love when a book puts you through your paces. Gabriel's job as security guard takes him to a derelict mansion in Berlin late at night. The obscure scene there reminds him of the most terrible night of his life - the night his parents died. Soon after, he receives a desperate call. His pregnant girlfriend Liz is being attacked and cries for help. Gabriel alerts the police but they arrive too late. Liz has disappeared without a trace. The hunt for her turns into a frantic chase against time. The terrifying man from the past has returned and will not stop until Gabriel is completely destroyed. Gabriel has a thing about basements, witnessing something as a child he now has a deep fear and would rather not go in. When he does a favour for a work colleague he finds himself facing his fears, getting caught up in a cat and mouse game and if that isn't enough his girlfriend has been kidnapped. Gabriel finds himself the focus of the police in a murder investigation as well as a psychopath, in order to find his lady he needs to address memories he has long kept suppressed. The story splits between Gabriel and what is going on with him and Liz, before she is kidnapped, during and what comes next. Quite a lot of the book is suspense and you are engaged enough to keep turning the pages, I wanted to know what was coming next. However I did find some aspects of the book frustrating, some of the characters actions and behaviours. However, many have absolutely loved this book, I enjoyed it but didn't love it. It does keep the readers on their toes as I couldn't work out the why or what they were going to do next. 3/5 for me this time, I would read this author again but I won't be rushing out to find their other work. 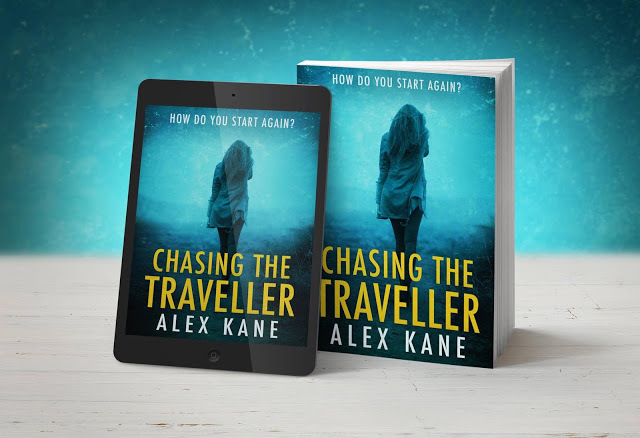 Welcoming author Alex Kane to So Many Books, So Little Time. To chat about her brand new book, Chasing the Traveller. You can read my review for this book by clicking here. 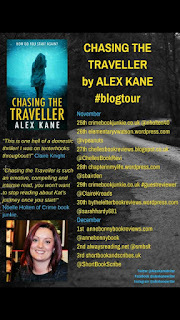 Today is my stop on the blog tour for Chasing The Traveller by Alex Kane. Thanks so much Alex for writing a great book, asking me on the tour and taking time out to answer some questions. You wrote under a different name previously, incase anyone doesn’t know, what was it and why the change? I write supernatural crime thrillers under Emma Clapperton. I changed my name for the genre switch because I didn’t want people to buy the book and expect supernatural crime and get something different. What made you choose the travelling community as the set up for this story? I have a genuine interest in the travelling community and there didn’t seem to be any books out there that tackled such domestic abuse within that setting. Domestic violence and emotional abuse are horrific topics, some of the scenes will be very disturbing for some readers due to their realistic creation. How did you manage to create/tap into this? Honestly, I have been fortunate enough not to experience this kind of thing in my life. I can only imagine what it must be like for someone to go through this kind of thing. I tried to imagine how awful it would be and how I would feel if my partner was controlling everything I did, who I saw, what I wore, even what I said. It must be the loneliest place a person can be. When I picked this book up I thought it was going to be more of a murder thriller type read. Whilst there are themes of this, for me the heart is Kat’s personal journey, was this your vision for the book? I wanted to write about Kat and her escape. However, I can’t imagine the torment automatically stops when you leave that kind of relationship. I wanted to write about her journey, her road to recovery and finding herself again. Of course, with it being a psychological thriller, I wanted to include some drama in there too. What research did you do for Chasing the Traveller and did you enjoy it? I used to work with someone who is a traveller. She was great at helping me out with the language and certain words or phrases that are typically used. I really enjoyed learning about the community and how they live. 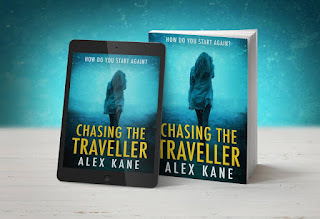 What is next for Alex Kane? Do you prefer folk calling you Alex or Emma? Say online or at book events? Depending on how they know me, I will respond to either. Do you have book events lined up for this book? Signings? Author chats? 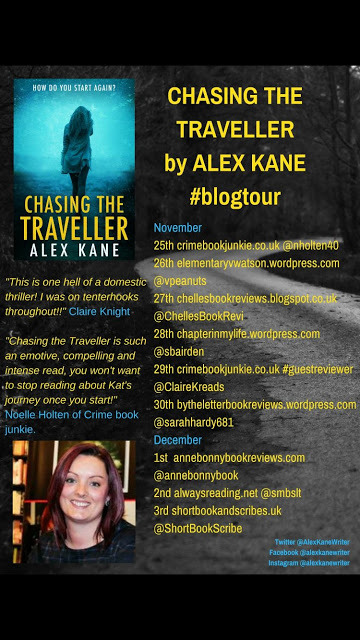 Yes, there is a blog tour lined up to run until Sunday 3rd December and I ran a competition on publication day for people to win signed copies. Where is best for fans to contact you? Find you? Twitter, Facebook, Instagram. Alex Kane Writer. Anything else you would like to add I haven’t asked? Thank you for being part of the blog tour and I hope everyone who reads the book will enjoy it. Check out the other stops on the blog tour for different content and reviews.